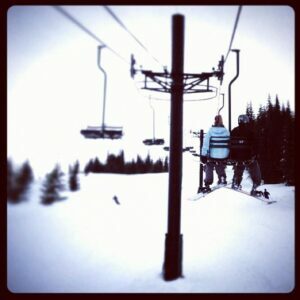 Riding the chair lift at Snoqualmie. Photo: Kristin Kruger. This is the mantra we who love the snow have to remind ourselves as springtime rolls into the Northwest and the fever for summer hits us like a rogue wave of grilled hot dogs. It may have been over 70 degrees in Seattle over Easter weekend but don’t tell that to the Cascades because they are still getting snow measured in feet! Mt. 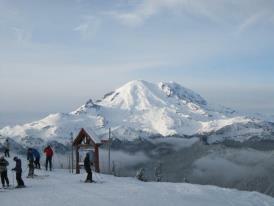 Rainier from summit of Crystal Mountain. Photo by Danielle Decker. Can you say cheap lift tickets and sweet goggle lines!?! Crystal Mountain is currently scheduled to be open until June 16th and Alpental at the Summit at Snoqualmie through the first week of May. Last year we saw lifts turning past the 4th of July so the dates have the potential to change. Get out there and ride those soft turns!